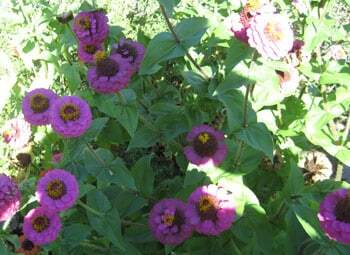 Guide to Growing Zinnia, Profusion flower. 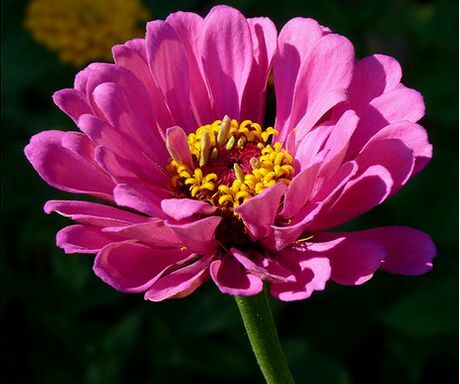 Zinnia plants are half hardy annuals that range from 20 to 90 cm (8 to 36 inches) in height. They bloom from summer through to the first frost, and carry double blooms with flowers of pink, purple, red, orange, or white. They are able to grown in zones 2 through 10, and can be sown out in the garden after the last frost. Profusion flower (above) and Common Zinnia (below). Common species of Zinnia grown in the garden include Profusion flower and 'youth and old age'. Common Names: Zinnia: Rocky Mountain; Common; Purple; Plains; Desert; Wild; Spinyleaf; Narrowleaf; Bush; Mexican. Scientific Names: Zinnia elegans; Z. angustifolia; Z. grandiflora; Z. acerosa; Z. peruviana. Flower Details: White, yellow, yellow-green, cream, gold, burgundy, pink, red, purple, violet, orange. Multi, contrasting colours. Double ray florets; central disc. Dome. Papery. Foliage: Green. Opposite. Linear through to Ovate. Sow Outside: Cover seed. Following the last frost. Spacing 5 to 12 inches (12 to 30 cm). Sow Inside: Germination time: one week to one month. Temperature 70 to 80°F (21 to 27°C). Seven or eight weeks in advance. Transplant outdoors following the last frost. Requirements: Full sunlight or afternoon shade. Good drainage. Soil pH 6 to 7. Rich soil. Humus. Moist soil. Mix in manure. Regular watering to surrounding soil. Feed when transplanting. Feed at the start of flowering. Pinch tips. 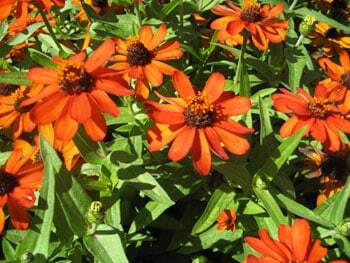 If growing Zinnia from seed then sow outdoors following the last frost of spring; lightly cover the seed once sown. Plants should be spaced at 15 to 20 cm (6 to 8 inches; small); 25 to 30 cm (10 to 12 inches; medium) or 45 cm (18 inches; large Zinnia species) apart. Ideally grow Zinnia in a sunny area of the garden that gets an afternoon shade. The plants are able to grow in most soils of pH 6 to 7, but soil should be enriched with manure for best results. In cold areas it may be a good idea to start off Zinnia indoors first; do so about seven weeks in advance of transplanting. It should take about one to three weeks to germinate Zinnia at a temperature of 20 to 27 degrees Celsius. Transplant outdoors just after the last possible frost of spring. Purple Zinnia by Dendroica Cerulea. It is easy to look after Zinnia. Keep them well watered and feed them in the spring. 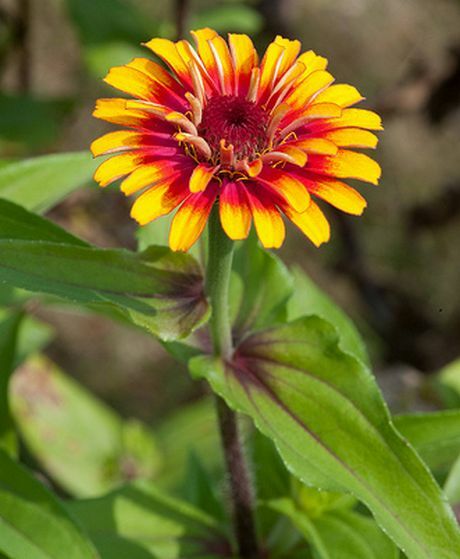 Pinch back Zinnia plants to encourage branching; feed again once they start to flower. Remove (deadhead) dying flowers.